Growers House has the largest selection of the best LED manufacturers on the market. The brands we carry are field-tested and proven to work under the harshest conditions. California Light Works LEDs are potency focused and are leading the industry in both greenhouses and indoor gardens. California Light Works products. Check out the Growers House selection today! We also provide a huge selection of complete LED tent packages that include everything you need to get started growing! 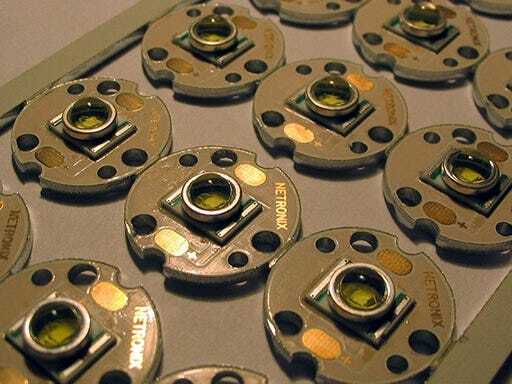 LEDs or light-emitting diodes are a semiconductor light source and most LED grow lights are made up of hundreds of these surface mounted components. Different colors are brought together to form a collection of light that achieves the desired color spectrum. Some of the many advantages LEDs have over other conventional light sources are lower energy consumption, longer lifetime and smaller sizes allowing for more versatile uses for indoor grow lights. GrowersHouse only carries LED Grow Lights made by the best LED manufacturers that have high-quality products with warranties--often made in the USA. California Light Works has proven to be a leader within the industry for potency focused LEDs for both indoors and greenhouse. California Light Works also offers the ability to control all of your garden via a central controller. View all of California Light Works products.